Bread | Where's my backpack? I got up this morning and was greeted with a loaf of bread that had sprouted strange new life forms. What is up with bread in America? It never goes stale, it goes mouldy…at an alarming rate. As I stood in front of the now floriferous loaf, I pondered the conundrum and came to the conclusion that it’s because Americans insist on putting bucket loads of sugar into their breads, and if not sugar, then honey, molasses or other sweetening agents that have no business making their home in a loaf of bread. Cakes, yes. Bread, no. No matter how much time I spend in the States, I cannot avoid a ‘yeuch’ moment when I bite into something that is supposed to be savoury and taste sweetness. As I boiled the water for coffee, I thought about the misconception many Americans have that Irish soda bread is slightly sweet with raisins in it. Don’t get me wrong – we have nothing against raisins, but when we put them in dough we call the end result cakes, raisin bread or tea loaves – not soda bread. The bakery just down the street proudly sells a raisin and caraway seed loaf masquerading as Irish soda bread. I rail inwardly every time I pass by. With the coffee brewing, I figured I’d have enough time to pop downstairs and pick up a new loaf, but I stopped halfway out the door. Why bother? It’ll be as disappointingly sugary as the last loaf, and mouldy by tomorrow. Why not make my own soda bread instead? It’s ridiculously easy and incredibly quick to make. I checked the cupboards and found, to my delight, I had everything I needed to make proper Irish soda bread. 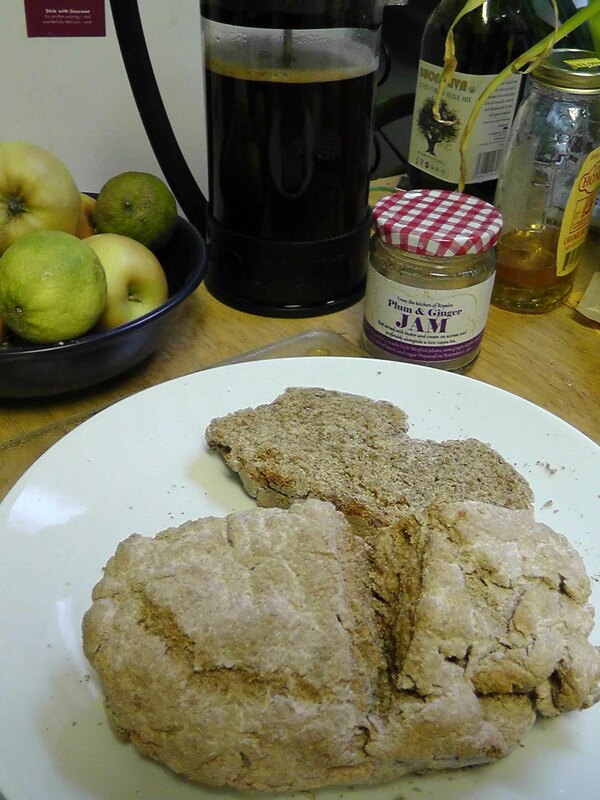 45 minutes later I sat down to a breakfast of freshly baked soda bread, plum and ginger jam and a second pot of coffee. I may never buy another loaf of bread in the States. Measure three and a half cups of flour – white, or a mix of white and whole wheat, throw in some oatmeal if you like. I just had whole wheat so that’s what I used. Add 1 tsp baking soda and 1 tsp salt to the flour. Sieve to mix. Measure 2 cups of buttermilk or soured milk. I had neither, so I did what I was taught to do when I was knee-high to a grasshopper – add 1 tsp vinegar to 2 cups fresh milk and leave for a few minutes to sour – do it while you’re sieving the flour. Add the milk to the flour, a little at a time, mixing with your fingers. No need to be too thorough, you don’t want a smooth dough, it should be squishy but raggy and floury in parts, with just enough moisture to push it all together into a big lump – I didn’t use the whole 2 cups, it depends on the flour you use. Turn it out onto a floured surface, knead for about 15 seconds and shape into a round loaf. Place on a floured baking tray, cut a fairly deep cross in the top of the loaf (about half the depth of the loaf) and bake in the oven for 40-45 minutes. To see if it’s done, flip it over and knock on the bottom of the loaf. If it sounds hollow, it’s ready. For a softer crust, wrap it in a teatowel right out of the oven; for a crispy crust (you’ll need strong teeth), let it cool on a wire rack. This entry was posted in Ireland, Photography, Travel and tagged food, photography, photos, postaday, travel. Bookmark the permalink. Interesting. I’ve heard the term Scotch loaf used to describe batch bread, which is a plain white soft-crusted bread with no raisins. I looked it up on the internet and see the term is used for not only that, but for plain bread containing raisins, sweetened bread containing citrus peel and one very interesting variation containing rose water. Hi Ailsa, you could also use sour cream or yogourt to seed your milk. Thanks for your tips on technique and authenticity… Can’t wait to try your recipe and just in time for St. Patrick’s Day! Speaking of which, you wouldn’t happen to have any more suggestions to fill out the menu, would you? I’ll give the sour cream a try next time, Deb. Not sure what entree you’re planning for Paddy’s Day, but try to include colcannon – I mention how to make it in my Hallowe’en post – and finish off with a good Irish coffee! I have fond memories of Soda Bread from a Donegal bakery. It was wonderful. I agree…. what Americans think of as soda bread really isn’t. I make my own, with a recipe similar to your. Actually, it’s exactly the same.